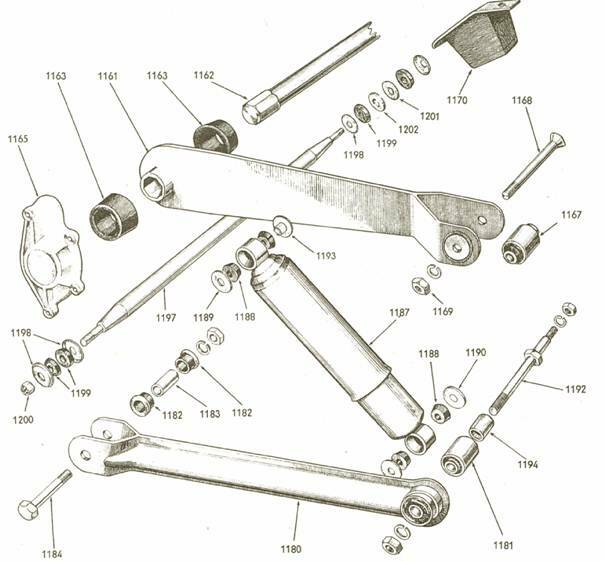 This illustration depicts a variety of hardware used by Jowett Cars Limited. A vehicle manufactured by Jowett Cars Limited (JCL) was assembled using hardware to hold components together. In modern times, the motor industry tends to use the term 'fasteners', which probably originated in the USA. The term 'hardware' refers to such items as bolts, setscrews, machine screws, grub screws, nuts of all types, plain washers, spring washers, internal teeth washers, drive keys, mills pins, cotter pins, split pins, dowels and circlips – to name just a few. With respect to the post WW2 Jowetts, virtually all threads were of the British Standard Fine (BSF) type. The other thread adopted by Jowett Cars Limited was the British Association (BA) thread for hardware of a lesser thread diameter than ¼". The best known alternative threads were British Standard Whitworth (BSW), and the Unified National Fine (UNF) that had been adopted by the North American Society of Automotive Engineers (SAE). Hence the description of a piece of hardware being described as SAE-UNF. There is also a Unified National Coarse (UNC) thread that was adopted by the SAE. Jowett vehicles, in taking components from outside suppliers, did use some items of hardware of the SAE format. Because Britain had made the decision to adopt the SAE system for its motor industry, no doubt influenced by the local Ford and Vauxhall (GM) companies taking large numbers of components from the specialist industry. For a time, in the early 1950s, there was a fairly confusing mixture of the two basic types of threaded hardware – today there is an even worse situation with respect to the SAE and metric systems, where confusion now reigns supreme! We now have the situation where a UNF threaded setscrew or bolt, with metric across the flats head dimension, is supplied in sealed packaging along with a nut that conforms to the SAE across the flats dimension for the nut size. A poor mechanic, working on a SAE equipped vehicle, replacing bolts may need metric spanners as well. Bring back Dr Frederick Lanchester LL.D., F.R.S. please! British Standard Whitworth – exhaust flange joint, brass mudguard setscrews and nuts (Jupiter). Another use of the Whitworth thread form was in the Javelin/Jupiter flywheel. Two 3/8" BSW threads have been provided for push-off jacking setscrews for flywheel removal from the crankshaft. It is very likely that BSW was used here because, traditionally BSW setscrews were made from mild steel, and therefore would not have damaged the surface of the rear face of the crankshaft. SAE Unified National Coarse – fan belt adjuster lug on dynamo, inside starter motor and dynamo (Lucas). This use of non-standard hardware, was, while the vehicles were in their early operational life, easily handled by the average trained mechanic. It was when the vehicles came to be serviced and/or repaired by unknowing novices, that serious problems arose. A very good example was the forcing-on of a BSF nut onto a UNF thread on a wheel cylinder mounting stud. It could be fairly easily forced, and once in place in a dry condition, due to the forced conforming of the thread types, became very prone to severe rust corrosion. This condition would, in most instances, cause the stud to shear off flush with the wheel cylinder housing – rendering it useless and most probably, scrapped. Our loss! JCL introduced, with the release of the Jowett Javelin, a code system to identify hardware type by its given part number. There is a code system for all standard nuts, bolts, setscrews, machine screws and threaded studs. The system code can be quite easily opened up to inform of the component of hardware's specification. Part numbers allocated can be analysed as follows under separate headings. Overall, the Jowett system is a very good system, once the system becomes clearer. It can never become totally clear because a number of anomalies crept in. For instance, special nuts, for example the ⅜" self locking Simmons nut at the water pump pulley – this item has been allocated a Jowett five digit part number commencing with '5'. This is very strange as it could have so easily been absorbed into the hardware part numbering system. Another anomaly is the absence of listed hardware items in the spare parts catalogues. There must have been a listing somewhere in the service system so that dealer parts departments could order standard items. Or did dealer workshops purchase hardware items locally? Research into this article has revealed some miss-prints that have carried through all Javelin Spare Parts Catalogues. For example, the castellated (slotted) nut that secures the steering arms to the stub axles is in fact ⅝" BSF, not ½" BSF as shown. In addition, some strange changes to the part numbering and identification system did occur. For example, one of the bolts securing the Javelin steering column to the steering box is listed as, Part Number FB604/10A, and identified as a setscrew. Its fellow bolts are shown as FB604/7A, and are listed as being setscrews as well. A steering column would have to be dismantled to attempt working the reasoning behind the bolt code and the 'A' suffixes. With respect to threaded studs, some have three different part numbers for identical components, in the same applications over the manufacturing period..
05 = Bolt Diameter, 5/16"
Thus Part Number FB105/8 identifies a 5/16" x 1" BSF Bolt. It should be noted that all Jowett installed BSF bolts and setscrews are of the high-tensile type. A bolt removed from a car that is of BSF thread and has raised relief markings on its head, is a high-tensile bolt. Any bolt, with few exceptions, that has a plain unmarked head must be considered to be of mild steel or similar material. The exceptions are bolts such as flywheel retention bolts, big end cap bolts, front spring arm pin and front brake back plate bolts. These are bolts that were manufactured by Jowett, are high-tensile and have no (or minimal) head markings. These bolts can be identified by their five digit Jowett part numbers that commence with a five, or a 'J' (5 or J5). Thus Part Number FS105/8 identifies a 5/16" x 1" BSF Setscrew. Thus Part Number FS105/8 identifies a 1/4" x 1/2" BSF Machine Screw. Thus Part Number FN105/8 identifies a 5/16" BSF Nut (Standard thickness). Setscrew, ¼" x ⅝" BSF (High Tensile) – Oil Pump Cover to Body, Detent Housing. Note: A stud in this example is a length of high tensile rod that has been threaded, individually, from each end. A stud should not be confused with 'all-thread' rod. A stud should never bottom in its thread, it should be tightened against its shank.